You’ll excuse the Marlene Dietrich reference, but Mustard Seed’s Artistic Director, Deanna Jent, has brought her wonderful play, “Falling” back to town after it has been off-Broadway and numerous venues throughout the country. Now a property of Samuel French, “Falling” has gained praise and support from audiences and advocates of autism awareness everywhere. The important thing about this play is that it for the general audience and, despite being a visceral plea for a better understanding of autism and coping with a family member who can turn destructive in a moment, it appeals on a more conventional level for those not dealing with it on a daily basis. Directing her own play, Jent has an older son with autism so she speaks from experience. Reuniting (almost) the Fall, 2011 cast from her initial production, “Falling” proves just as powerful and leaves no doubt why this play has been universally accepted and praised for its frank and honest portrayal. Looking over some notes from that first production, I noted the power and the relevance of the show as both a theatrical presentation and as a seldom seen look for most of us of what this debilitating condition can cause. As she states in the play, there can be months of calm and then sudden outbursts of anger as it seems to come in cycles that have no rhyme or reason. Josh, the young man in the play, has obvious developmental problems that keeps the whole family on edge. His sister, Lisa, is afraid of him and the husband, Bill, is very good at coping and calming Josh down but also has reservations about him continuing to live under their roof. 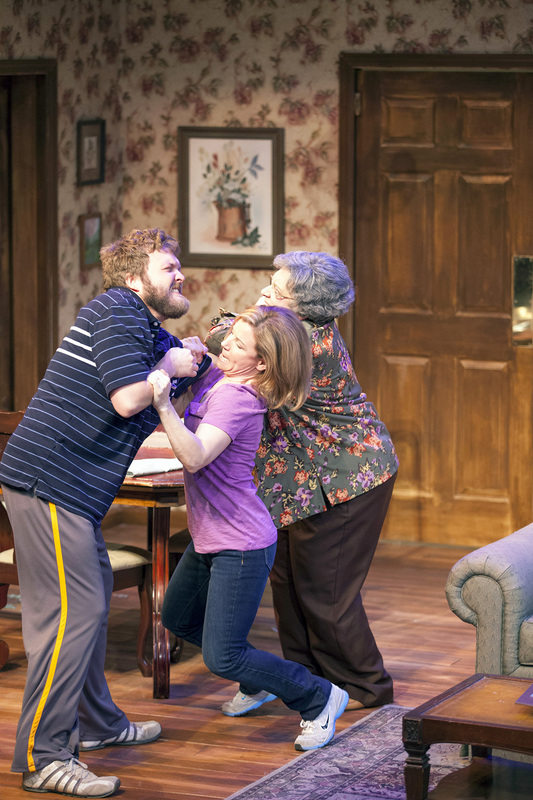 The mother, Tami, is vacillating about sending him to a facility that cares for severe autism patients because she realizes the risks involved- even though she takes the brunt of the anger during the play. She knows that by staying at home, he will get the love and attention he needs. Also involved is a visit from Bill’s bible-thumping mother, Sue, who quickly learns the dangers the family is in with Josh’s sudden and often violent outbursts. Michelle Hand again is a marvel as Tami. Her mixture of sympathy and fear makes her the central figure that pivots the actions of the rest of the family. Her small stature makes the audience even more fearful when a particularly violent scene leads into a turning point for the play. Greg Johnston also shines in the role he created of the husband, Bill. It’s stunning how good he can be with his son realizing how Josh’s behavior is affecting his marriage and the well being of his family. Reprising her role of daughter Lisa is Katie Donnelly. She, as well, has learned to cope but her displays of anger show a teen-ager’s frustration of feeling like she’s “second best” while she also is convincing at showing real fear. Daniel Lanier has taken over the role of Josh and, though not quite as big and intimidating as the original Josh, he is superb in portraying the sudden “triggers” that send him from a clam and relaxed young man to a sometimes paranoid and somewhat dangerous figure. He is able to sustain this remarkable character throughout and is also particularly effective in a short sequence near play’s end. Rounding out the cast is the returning Carmen Russell as Bill’s mother. She has honed this character into a truly believable portrayal of a woman who believes faith is the answer to all problems only to have that faith shaken by her first-hand knowledge of what this family is going through. Deanna Jent says in her program notes that she has dubbed this “Extreme Parenting” as the family tries to “tap dance through a mine field.” An apt description. 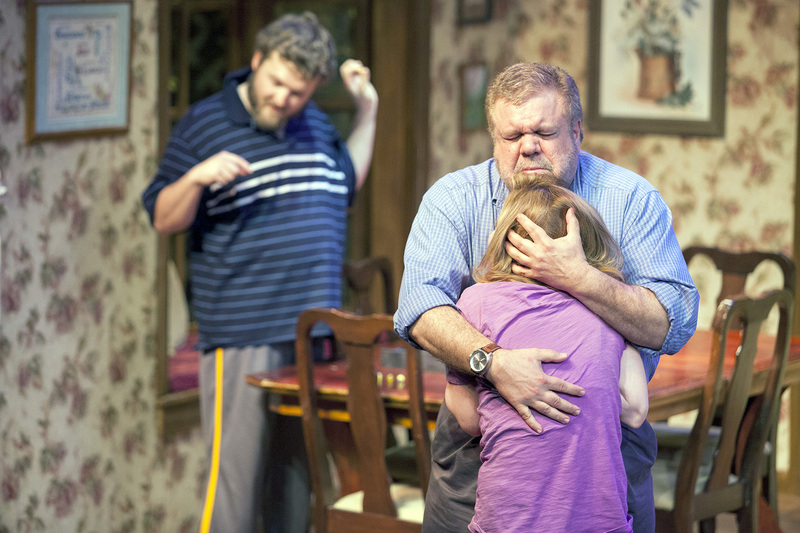 John Stark’s set design again recreates this suburban home and has flipped 180 degrees from the last performance. Michael Sullivan’s lighting design enhances the action and Jane Sullivan’s costumes are right on the money. Working from a broad recreation of her own experience, playwright and director Deanna Jent has shown us once again why her play has been so successful. It takes luck, of course, but it was inevitable as her play is brilliantly constructed and looks to be a perennial favorite in regional, college and even community theaters for some time to come. This production is scheduled to run through May 4th but don’t be surprised- like the first time it played- to find it extended due to popular demand. Give Mustard Seed Theatre a call at 314-719-8060 or contact them at mustardseedtheatre.com for tickets or more information. This entry was posted on April 14, 2014 at 9:43 pm04 and is filed under Uncategorized. You can follow any responses to this entry through the RSS 2.0 feed. You can leave a response, or trackback from your own site.